Cute cat with a modular system featuring Bug Brand and Serge-inspired modules. From Shadow Justice Crew on Instagram. It’s been a little while since we last attended Church of Thee Super Serge at Robotspeak in San Francisco, but we made a point of going this past weekend. 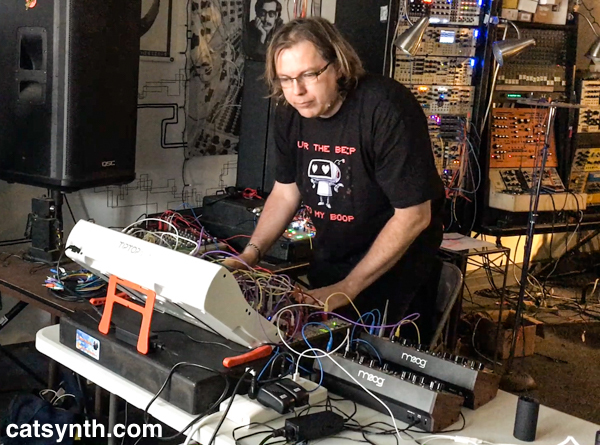 For those who have not been there or read our past reviews, it’s an almost-ever-month show on a Saturday afternoon with live hardware-synthesizer performances. As the name suggests, some acts do include Serge synthesizers, but it is not required, and a wide variety of instruments are used. All three sets are featured in our most recent CatSynth TV episode. The first set featured Lx Rudis performing on an Oberheim Xpander, a somewhat underappreciated instrument from the 1980s. At its heart, the Xpander is a 6 voice analog synthesizer, but with a complex array of digital controls that can be programmed and applied independently to each voice. Lx Rudis took full advantage of these, especially the LFOs and lag generators, to create subtle and minimal metric patterns. He constantly moved voices in and out, configuring them on the fly, in a way that was very expressive and musical. I particularly liked the sections which had staccato rhythmic textures against slowly moving timbres deliberately out of sync with one another. Next up was Franck Martin, who performed a solo set on a modular synthesizer with several standalone instruments. 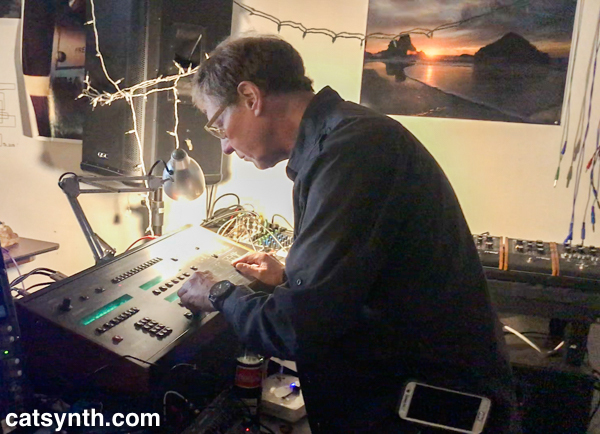 Martin’s setup included a Moog Subharmonicon, which he built while attending Moogfest this year (we at CatSynth are a bit envious), as well as a DFAM (Drummer From Another Mother). 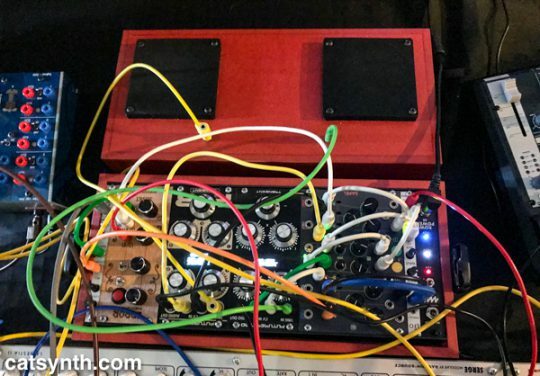 There were also additional voices provided by Braids and Plaits modules from Mutable Instruments that he could bring in and out using a touch-plate interface. The result was a slowly changing beat pattern with an eerie inharmonic voicing and gentle undulation. The final set featured our friends Gino Robair and Tom Djll teaming up as the brilliantly named Unpopular Electronics. 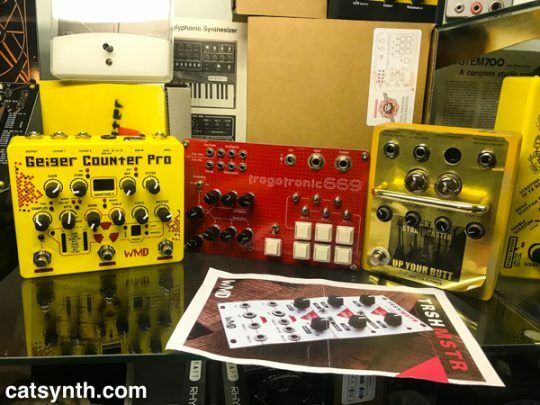 They had a wide variety of gear, including Serge panels in addition to Eurorack modules and standalone instruments from Bugbrand and others. In addition, Gino had an interesting small case that included touchpads. The music was frenetic and intense, an avalanche of pops and hits and loud cloudlike tone clusters. And there were trumpet sounds entering into the mix at various points. But there was an exquisite detail to the madness with changes among the different instruments and sounds, and musical pauses and rests before the pair dived back into the frenzy. There were also many moments of humor and not just Djll’s book about why there aren’t any Zeppelin-style airships in the United States. In between sets, it’s fun to browse around Robotspeak and see what’s for sale, or on display in the big glass case. 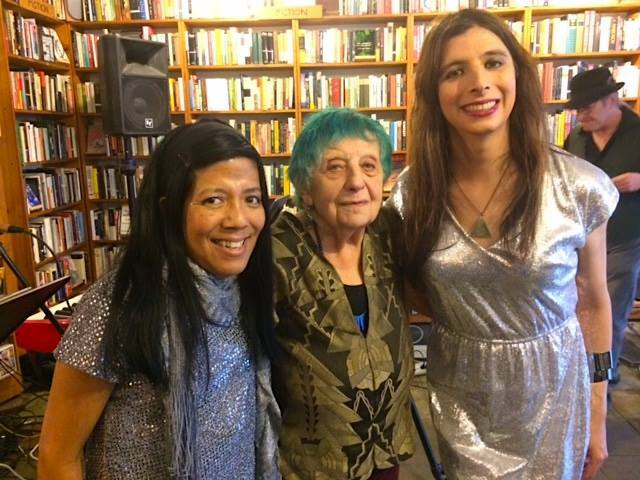 Today we look back at the final concert of the 2015 San Francisco Electronic Music Festival. 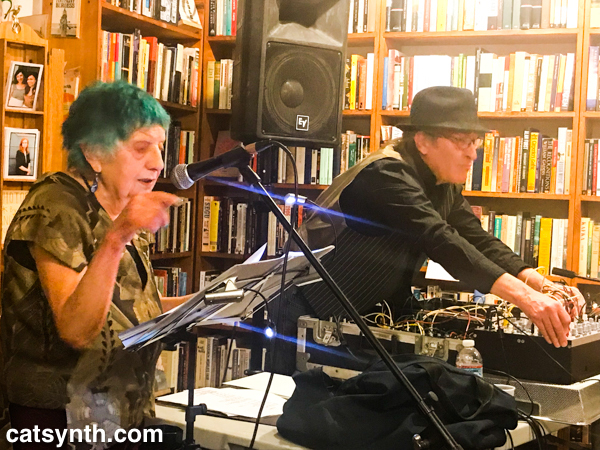 The program featured artists – some familiar, some new – exploring different aspects of electronic music, both aurally and visually. The evening opened with AQULAQUTAQU, a “fractal alien operetta” by Kevin Blechdom (aka Kristin Grace Erickson) in collaboration with Madison Heying, Matthew Galvin and David Kant. The operetta, complete with visuals, costumes, and dance, follows the story of two scientists on the planet AQULAQUTAQU, whose discoveries run afoul of the theocratic rulers of the planet (at a level Earth’s contemporary theocrats could only dream of) and end up feeling the planet for Earth. During the story, one of the scientists presents the story of Ladle Rat Rotten Hut, a corruption of Little Red Riding Hood complete with images of vague homophones to the words of the story, and a larger-than-life wolf costume. The journey to Earth sets a very different tone from the sections on the homeworld, and the finale in which the arrivals on Earth have a dance party (with the wolf joining in) was fun and reminded me of 1960’s tropes where everyone comes out and dances in the middle or end of a show. The next set was a solo performance by Doug Lynner on his original Serge modular synthesizer along with a Cyndustries Zeroscillator. We have frequently chronicled Doug Lynner and his virtuosic performances here on CatSynth, and they are always impressive, sometimes quite subtle and intricate before breaking out into louder noisier sections. This one was a bit different, focusing more on beats and harmonies that approached traditional Western music, perhaps even a bit towards electronica. Of course it was all done with the same instrumentation as his more abstract performances – the Serge modulars tend to have simple functions like slopes that are combined into more complex signals, so it likely takes a bit to assemble something as rhythmic and harmonic as this performance was. The final set featured a piece by Olivia Block titled Aberration of Light. Originally composed for a live cinema piece, it was presented here as a four-channel realization in a darkened hall. The one minimalist visual element was a single cone of light striking fog (emitted from a machine offstage). The piece and the visual was meditative. One could focus on just the sounds and the interaction with the room, which forms another instrument of the piece, but I did find myself focused on the light cone as I am often drawn to minimalist visual elements. 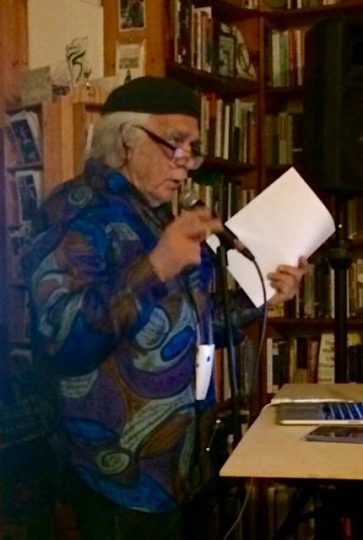 It also gave the performance a more mysterious quality than would have been present if the room was entirely dark. Overall it was a solid show and thought Block’s piece was a great ending to the festival. Because of many circumstances beyond the scope of this article, this final show of SFEMF was the only one I was able to attend the year. I am glad I was able to make it, and looking forward to next year’s festival. We have covered several of the Church of the Superserge shows at Robotspeak over the past year or so. And now I will be performing in one as part of a special Analog Ladies edition. 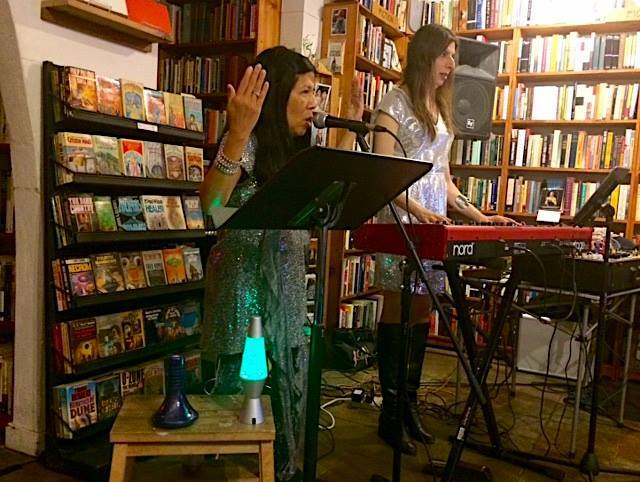 It will be an afternoon of analog synthesizer madness featuring several of instrument’s most talented women: Jill Fraser, Mint Park, Amanda Chaudhary, Miss Moist, and 7H1NG2. 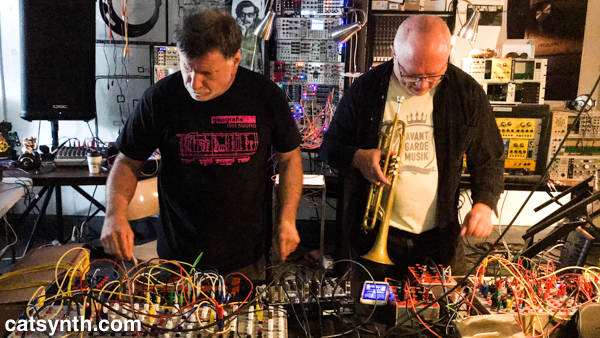 It’s a casual BYOB event, so if you’re in San Francisco (or anywhere on the Bay Area transit grid) and free tomorrow afternoon, please drop by Robotspeak (589 1/2 Haight Street in SF) to hear us. I will performing on my analog modular plus Moog Theremini, and probably wearing something with a feline theme. Here is a photo of the modular as I start to set up the initial patch for tomorrow’s set.